There are many different types of File sharing apps for that you can use for your iPhone. In this blog, we focus on the iOS platform. With a fully functional App store at its disposal, you can find multiple applications. We have listed below the 10 File Sharing Apps for your iPhone which shall serve you the best. File Sharing has never been easier. Xender can share anything from documents, photos to videos with the simple click of the button. It sends files within matter of seconds across to other devices apart from iPhones without using the internet or Bluetooth. It’s latest version has ‘Phone Replicate’ which makes it easy to shift to a new iPhone. With this feature, you can transfer all the data from one iPhone to another. It is easily compatible with iOS 8.0 and above. Offering 17 languages, Xender lists as number one on our list of the Top 10 File Sharing Apps on iPhone. Probably the most commonly used File sharing app on iPhone, Shareit has proven itself trustworthy time and again. Apart from traditional file sharing features like video, audio and document sharing, it also works as a music player! The latest version supports 29 different languages and compatible with iOS 7.0 or it’s later versions. Earning immense popularity with it’s users, Zapya offers easy file sharing. Boasting amazing features such as AirDrop to file share amongst iOS and Mac devices and QR Code Sharing for instant File Sharing via QR Codes, Zapya is winning brownie points left and right. Easily compatible with iOS version 7.0 and above, Zapya supports 6 languages. Taking data security seriously, Send Anywhere takes File Sharing to the top notch. It offers a feature in which once all the files, be it audio, video or documents are selected, it generates a 6 – digit key. Once this same key is entered in the receiver’s iPhone, only then is files shared instantaneously. Offering video playback and music playing options, Send Anywhere is a very user-friendly application. Offering services in 19+ languages, it is compatible with iOS 9.0 and later. Keep your eyes open for this one folks! This application in particular helps professionals to file share easily. It provides the ease of sharing and accessing files simultaneously. This way, we can edit and work on them in real time. Offering a 30 day trial period for free, we are sure that once you use it, you will surely sign up for the paid version. Offering its multiple features in 21 different languages, Dropbox is available on iOS 9.0 and above. This application is the most suitable for people who take loads of photographs and then share it with their friends and family members. Allowing upto 10 GB of files in one go and even downloads it via your email. The free version works only for a week, but once you have tried this application for multiple file transfers in huge sizes, there is no doubt you will rush to sign up for the paid version at $ 10 a month. View your images as a visual board and enjoy yourselves. Currently out as a version 2, it is compatible on iOS 10.0 and above. With high recommendations that promise Pushbullet to be the app you never needed, we were a little hesitant. But, it has exceeded our expectations and delivered fantastically. With features like ‘Pushbullet Channels’ where one gets notifications about the different things they are interested in and interface so easy to navigate, one can sync all their devices, Mac or PC, together. Offering options like a chat window through which you can send files and even share text messages to further explain about the file that has been shared is like a cherry on the cake. Compatible with iOS 9.0 and later version. The last but not the least on our list of the best file sharing Apps on iPhone is MyMedia. Manage your device with ease with this app as it offers features like file manager in which one can read, edit and extract Zip files and then share them across platforms. Offering Audio player options, one can shuffle and repeat song files and play them back via the iPod. With Passcode lock in place, one can be secure that no one can access the application without your permission. While it supports 4 languages, it is easily compatible with iOS 8.0 and later versions. There you have it. 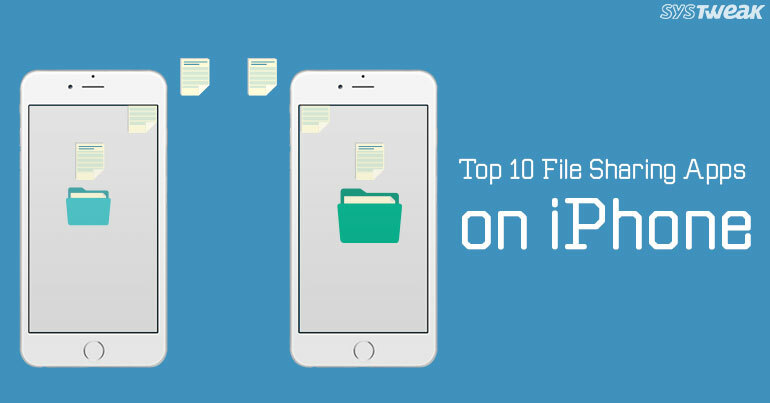 This extensive list features the top 10 best File Sharing Apps on the iPhone. Hope you agree with our list. Do drop in a line if you wanted any particular app to be featured. You can contact us with the comment section below.